The 6th of February marks the UN’s International Day of Zero-Tolerance for Female Genital Mutilation (FGM). In Kajiado County, Kenya, Aidlink has seen a reduction of 18% in FGM since we began working there. At Aidlink, we work on projects that aim to tackle harmful, cultural practices such as FGM and early marriage in Kenya by enhancing girls’ participation in education. Evidence shows that the longer we can keep girls in school, the less likely they are to undergo FGM. In Kajiado County, Kenya, where Aidlink works in partnership with the Girl Child Network within the Maasai community, there has been a reduction of 18% in FGM. If you can teach a girl about her human rights (to not be cut, to not be married off, and to go to school) then she is more likely to reject such harmful traditions. For the Maasai, FGM is a rite of passage signifying that a girl has become a woman and is ready for marriage, sometimes being carried out on girls as young as 9 or 10. There are many barriers to girl’s education in Kenya, one of which is the lack of sanitary facilities in school for menstruating girls. Aidlink provides basic provisions that we take for granted every day: access to water, latrines, sanitary towels and a changing room. However, the biggest barrier is the attitude of the community. FGM and early marriage are deeply embedded as part of the Maasai’s way of life. The picture above is of the Parents’ Association at Maparasha Primary School. 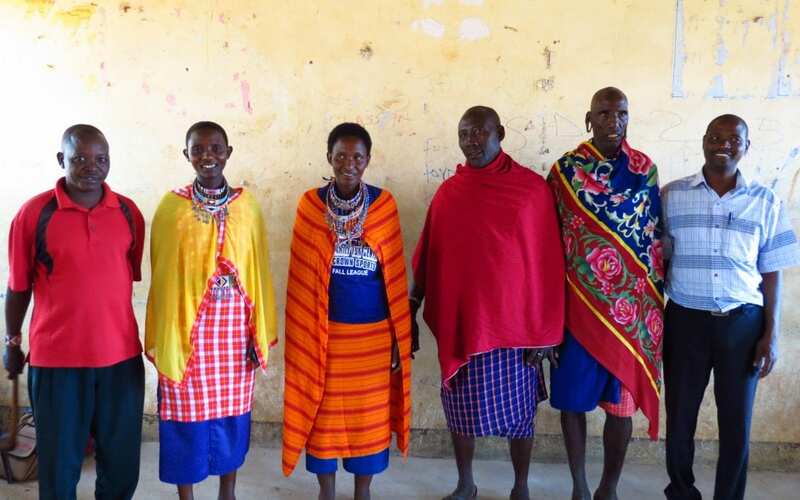 With training and support from Aidlink and the Girl Child Network, these 6 people are at the forefront of the fight against FGM and early marriage in their community. Being willing to stand up for anything in life is difficult, but it takes particular courage to stand up to your family, your neighbours, your whole community, and tell them that what they believe is wrong and harmful; that the girl child is not worth less than the boys; that if you let her go to school then she too can achieve great things; to be willing to call the authorities and report your own community members who do not respect the rights of their children. It is because of the courage of people like the Maparasha Parents’ Association that we are starting to make inroads in the fight against FGM. Outsiders can apply pressure but change must come from within the community, and in that regard, the Maparasha Parents’ Associate are a vital force. The UN defines FGM as all procedures that involve altering or injuring the female genitalia for non-medical reasons. It is a harmful, cultural practice that highlights the inequality between sexes in society and is a violation of the human rights of girls and women to health, security, physical integrity, their right to be free from torture and cruel, inhuman or degrading treatments, and the right to life when the procedure results in death. Anaesthetics and antiseptics are rarely used, leading to serious infections, long-term health complications and traumatisation. It is estimated that 200 million girls and women in the world have been ‘cut’, with 44 million under the age of 14. FGM is most often carried out by older female relatives or community members, and is sometimes carried out by medical professionals, although there is no medical reason to perform FGM and it defies one of the most important medical ethics to ‘do no harm’. The practice of FGM is considered an initiation into womanhood in some cultures and communities, sometimes occurring for socio-economic reasons, as it is seen as a prerequisite for marriage. FGM is practiced in many cultures around the world, mostly in parts of Africa, Asia and the Middle East. According to the 2014 Kenya Demographic and Health Survey, 21% of women aged between 15 and 49 have undergone FGM. In certain communities, this statistic is higher. Aidlink works with the Maasai community in Kenya where 78% of the community practice FGM. FGM is illegal in many countries around the world, including Kenya. However, to truly help eliminate the practice of FGM it must come from within. Communities must come together to understand the awful effects that FGM has on a girl and society, raise awareness and breakdown the social constructs that continue to keep FGM alive.